It is a busy time at Cornerstone! The children are busy with big work, and there are many upcoming opportunities for you to experience life at Cornerstone. It is not too late to RSVP for the World Café for Early Childhood families on October 22. Dinner and childcare will be provided at 4pm in the MCM Lecture Room. Please email reception@mtcm.org if you would like to attend. Please note school is closed October 18-19 for staff in-service. While childcare is not provided, the Boys and Girls Club will be open 9am-5pm those days. Conferences are October 25-26 this fall. You should have received information about how to sign up – please let us know if you need the instructions resent. This is a really valuable opportunity to talk with your child’s guide. You can also talk with our CMES specialists during those days. Childcare will be available for the time of your conference. I also want to flag that the November Cornerstone Café is on November 2 at 8:30am. Mara Johnson, from Forest, will be our guide in residence that day. I hope you are enjoying fall! Dear families, your child will enjoy our beautiful outdoors if he/she is well prepared to keep dry and warm. Appropriate clothing helps the toddlers stay warm during their outdoor time for raking, sweeping, running, jumping, scooping and shoveling snow when it comes! As the weather cools, Children’s House 1 has begun delving into more work in our cozy environment. However, we’re not afraid to go outside. So long as everyone is properly attired, we will brave the elements as long as we can! Inside, the children and adults have been inspiring each other to great heights. We now have more than one child taking all pieces out of some of our lager puzzle maps and putting them back without assistance. 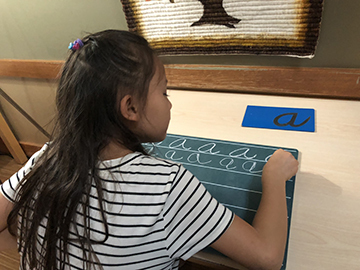 All children who write with instruments have taken joy in practicing cursive letters on our chalkboards. Outside of what is being presented, many children have found ways to extend their work with some materials in an explorative fashion. Children’s House Two has been going outside in rain or shine this month and we are very happy to be able to continue experiencing the outdoors no matter the weather. In the last week, we’ve gone outside to do a listening activity (listening with our eyes closed and naming the sounds we hear), taking turns sharing dance moves and then teaching our friends, and taking shelter under the play structure to tell a collective story while it rained. I love seizing the moment and feeling like our children’s house community is prepared for small adventures throughout the day. As the season continues to move from cold and wet, to colder and frozen, please make sure your child is coming to school with the appropriate weather gear to go outside. Consider keeping a checklist by the door so your child can also be accountable for remembering: hat, mittens/gloves, scarf, boots, coat. Support your child in checking in the car before they leave to make sure any items shed during the ride are not forgotten. If it feels easier, please feel free to leave a set of (labeled!) hat, glove, scarf, snow pant, boots at school so that you know that no matter what the morning brings, your child will have appropriate clothing to go outside in during the day. Here's a picture from our time outside. The Garden environment continues to be a dynamic place of learning. Recently many children have dove into big work. One group of young mathematicians work on the largest checkerboard multiplication problem I have ever seen, with the quotient into the octillions! We have groups researching sharks, dolphins, and poison dart frogs, among other interesting creatures. The curiosity for the workings of our world is alive and well as we explore why we have day and night, seasons, and why it seems to get dark so early right now! We are also expanding our writing skills through daily activities. This is a creative and insightful group and it is a delight to read about their ideas each day. I hope you are enjoying all the fall colors and staying dry in all of this rain. With the changing seasons, I love to give lessons about what causes the seasons on our Earth. In the Pond classroom, many children are working up to these lessons about the seasons. They have been learning about the movement of the Earth. The Earth rotates and because of this there is day and night. The Earth also revolves around the Sun. It takes one year to complete one revolution. We have been going into even more detail talking about how when a part of the Earth first turns into the light it is called dawn or sunrise, when the sun reaches its highest point in the sky it is called noon, and when it first turns into the shadows it is called sunset. Some children have begun work with lines of latitude and longitude and the times zones. There has also been a lot of experiments with plants. Children are experimenting with the needs of plants, learning about the main function of the flower, stem, root, and fruit. With all this rain, it’s also a good time to remind everyone to have a change of clothes (it gets slippery out there). I look forward to seeing all of you at conferences! There is so much wonderful learning and work taking place in our environment! Autumn is a great time of year to explore all kinds of science! Many Forest students have had lessons about how the rays from our star, the Sun, and the two "dances" of the Earth (rotation and revolution) combined with the tilt of the Earth's axis work together to create the seasons. The cool and rainy weather we've had recently has created the perfect conditions for mushrooms to flourish and to show their 'fruiting bodies' aboveground! I was initially inspired by a mushroom that was growing outside the Toddler's play area. So, a small group of Forest students had an initial lesson last week about the Fungus Kingdom. We used our Five Senses--and our olfactory sense, in particular--to explore the fruiting body of one of these mushrooms. Boy, was it ever stinky!! In fact, one of the students figured out that this mushroom belonged to a family called the stinkhorns...how appropriate! This group also went foraging in the "Secret Garden" next to the Boys & Girls' Club earlier this week and found several different species of mushrooms. These students are making spore prints, trying to grow mushrooms in the classroom and continuing to have more lessons about the Fungus Kingdom. Another group of students had lessons on photosynthesis and the Scientific Method and are learning to design and carry out their own photosynthesis experiments. Other students have had lessons on the Three Branches of Government, the Constitution and the Judicial Branch. Some Forest students are busy completing final copies of research reports about: 9/11, Renewable Energy, the Balkan Wars, Hedgehogs and The Great Depression. Others are working on independent or lesson follow-on work about US Presidents, the Fundamental Human Needs and Cultural Identity. As always, we continue to have lots of math, grammar/language and writing lessons! Fall Book Clubs are also underway! Despite the grey weather, things are active in Marsh! The equinox in September brings great opportunities to learn about the Sun and the Earth and how daylight changes around the globe. Many children were excited to learn that almost everywhere on the globe, people had 12 hours of daylight and 12 of darkness on September 21 (whereas today we’re down to 11 hours, 21 minutes). Children are also exploring acorns and learning about how native people processed them for food (see pictures). They will tell you it’s hard work - shelling, smashing, soaking out tannins. We aren’t sure we will ever get something edible, but it sure is exciting to try to figure it out. As we transition to less day light (but hopefully some sun, right? ), it is more important than ever that children have the clothing they need to support their active learning. Please check to see if your child has extra clothing and has what they need to go outside every day. It is an honor to work with your amazing children. Thank you for sharing them with us. Montessori Partner school Siembra Montessori is hosting a Dia de los Muertos celebration at Centro Tyrone Guzman for the entire community on November 2 at 6pm. All are invited! Free flu shots will be available at the Roosevelt Homes on Friday, October 26. Walk-ins are welcome. 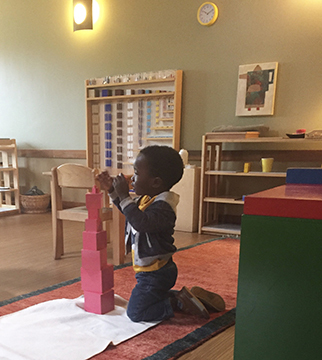 Ever thought about becoming a Montessori Guide? MCM is enrolling for both Primary (ages 3-6) training in Fall of 2019 and Elementary (ages 6-12) training starting in Summer of 2019. 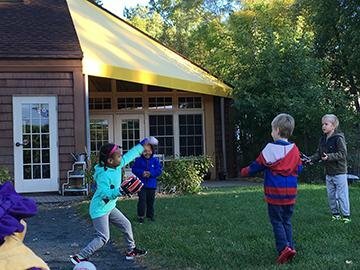 If you or someone you know is interested please visit our website at montessoricenterofmn.org for more information.